Brian Wier ended his 15-year boat ownership drought when he acquired the 32-foot-long Sea Bear and began a repower that transformed this boat into something truly exceptional. PPG got to go along for the ride and helped guide Brian through his decisions regarding the Sea Bear’s propulsion system. Brian ultimately chose Volvo Penta’s D4-300 Aquamatic Duoprop engine. But that was just the start. Brian knew what he wanted out of the Sea Bear – a boat capable of fishing in open water, but that also had the space, amenities and creature comforts for his wife and family. 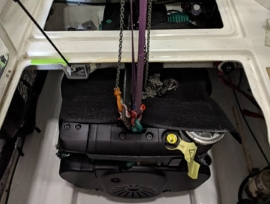 To achieve this goal, Brian not only went with the Volvo Penta engines, but replaced the boat’s hydraulics with Volvo Penta’s EDC system and installed the Glass Cockpit, docking station and joystick control. The Volvo Penta system ultimately gives the Sea Bear improved power and performance, fuel efficiency and maneuverability. “I really wanted the latest and the greatest,” he said. The Sea Bear was b uilt in 2002 by Sea Sport Boats in Bellingham, Washington. The catamaran hull boat was in good shape, but Brian wanted the interior to match the upgraded propulsion system. He selected North Harbor, a longtime partner of ours, to oversee the six-month rebuild of the boat. The work included adding air conditioning, an ice machine, new paint, a fly bridge and a half hardtop. The Sea Bear lettering was also replaced with stainless steel. 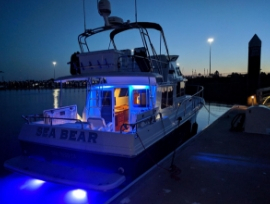 Brian initially planned to have the Sea Bear shipped to its new home in San Diego until North Harbor’s owner and the lead mechanic on the project offered to boat it down the West Coast. Brian agreed and the journey put the first 70 hours on the new engines. “What better way to have them broken in,” he said. The new Volvo Penta engines were up to the task. The North Harbor crew sent Brian videos during their trip to San Diego that showed how the Sea Bear was easily handling the journey. Brian said he constantly gets compliments about the boat when he’s at the marina in San Diego, the Sea Bear’s new port. The Sea Bear served as the backdrop for his daughter’s wedding. 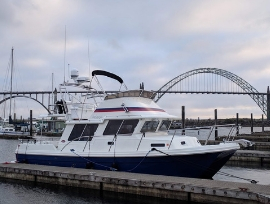 He and the family are having a great time fishing and enjoying the spacious interior, upgraded amenities and the boat’s performance at sea. But more importantly, Brian is continually impressed with the boat’s seaworthiness and its handling from the Volvo Penta engines. The docking station lets Brian easily crawl the boat sideways for mooring.